People are expressing a growing interest in plant-based diets recently. Because this strays from the norm, many people are left to try and figure out how to approach the vegetarian lifestyle on their own. 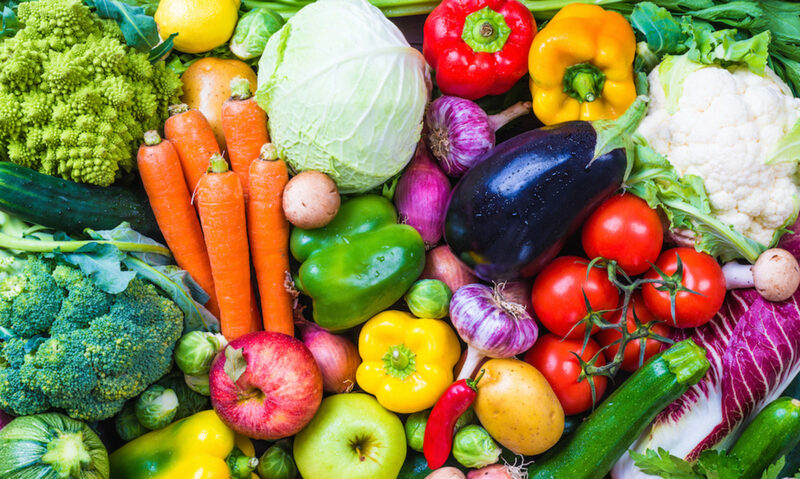 Oldways, a nonprofit food and nutrition education organization, recently released an updated food pyramid for vegans and vegetarians, modernizing the standards and guidelines to assist both newcomers and seasoned vegetarians alike in achieving a healthy, balanced diet. What Makes Oldway’s Vegetarian/Vegan Pyramid Relevant? There’s a ton of of competing – and sometimes contradicting – information available, so it’s not always clear which approach is best take to achieve the healthiest vegetarian diet possible. Transitioning from a meat-based to a plant-based diet means a lot more than simply eliminating meat. Often, knowledge, training and planning can help you achieve more balanced, well-rounded, healthy and satisfying vegetarian or vegan diet so this can be a positive, lasting lifestyle change. Oldway’s vegetarian food pyramid shows combinations of meals over a period of time, highlighting “the big picture,” a longer term plan to achieving better health on a plant-based diet. A well-balanced variety of foods is essential for a healthy life. Nutrient deficiency, oftentimes the basis for criticism of plant-based diets, is an avoidable problem foe vegans and vegetarians if they are properly educated. Armed with this knowledge and experience, a healthy and balanced vegetarian balanced diet will become second nature. 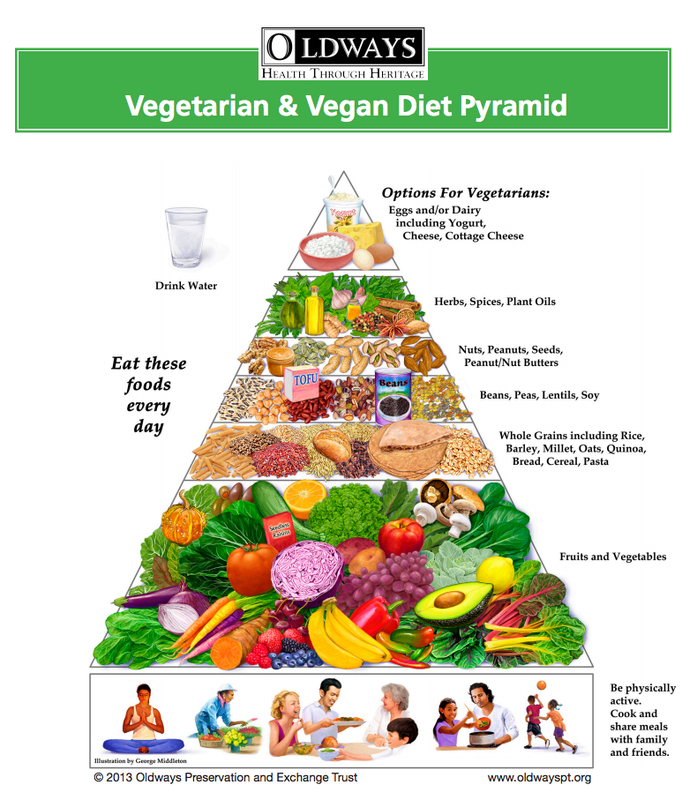 The latest version of the Oldways pyramid combines vegetarian and vegan pyramids together, which makes sense due to many areas of overlap. The new pyramid also includes a wider variety of plant-based foods and fruits than before. Fruits and vegetables makeup a huge proportion of the food pyramid, establishing the base. Depictions now include some of the more unusual but nutrient-rich choices to help inspire people to try new things, including kale, avocado, collard greens, and turnips. Herbs, spices and plant oils also got added to the food pyramid, bringing attention to the numerous phytonutrients, vitamins and minerals they can provide. Also noteworthy in the new pyramid are great ideas to get vegetarians and vegans outside of the bread box. 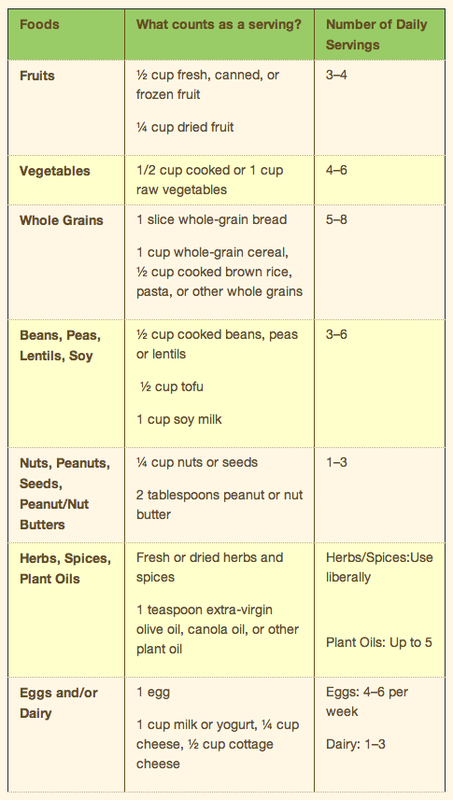 It suggests the whole grain choices can be diverse and include things like amaranth, millet, barley, and millet, whereas vegetarians may have relied more heavily on just pasta and bread before. The modernized Oldways vegetarian/vegan food pyramid also includes reminders to drink plenty of water, exercise, and to share meals with family and friends. The Oldways mission seeks to help people lead healthier lives by highlighting the fact that traditional foods not only delicious, but also nutritious. Among their most noteworthy projects has been to create Heritage Food Pyramids that specifically address the dietary needs of various cultures such as Mediterranean, Asian, Latino, and African. Their website, OldPT.org, includes a lot of great information and resources, including great recipes, time saving tips on meal prep, and reports of interesting studies that link diet with health. Next PostNext Is a Paleo-Vegetarian Diet Setting Yourself Up for Failure?